Figure 1. The red nodule on the patient’s forehead at presentation. Figure 2. The lesion shown in Figure 1 after two weeks’ treatment with topical imiquimod. Figure 3. Resolution of the lesion shown in Figure 1 after four weeks’ treatment with imiquimod. 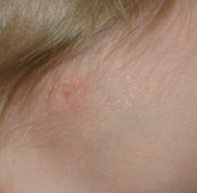 An 18-month-old girl presents with a red nodule of sudden onset on her forehead. Her parents report that it has been increasing in size and is prone to profuse bleeding. Spitz naevus. This benign juvenile melanocytic lesion is commonly amelanotic and may appear as a small pink to red nodule or papule. It can occur anywhere but is commonly located on the face and limbs. Spitz naevus undergoes a period of rapid growth but will typically stabilise and stop growing. The lesion is not prone to bleeding. Juvenile xanthogranuloma. The clinical appearance of this benign, self-resolving tumour of early childhood can be highly varied. Some lesions appear as papules or nodules; others are subcutaneous and more difficult to distinguish. 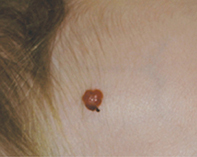 Although these lesions may initially appear red, they tend to become a yellow-brown colour. These lesions typically undergo an initial period of rapid growth and they may ulcerate – this can result in minor bleeding but severe bleeding does not occur. If juvenile xanthogranuloma is suspected, the patient should also be sent for ophthalmology review because ocular lesions, although rare, can occur and lead to increased intraocular pressure. 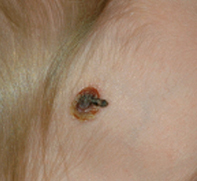 Amelanotic melanoma. Melanoma is rare in children, particularly prepubescent children. The most common types of melanoma, when they do occur in young children, are the superficial spreading and nodular subtypes.1 Some conditions may increase the risk of a melanoma – these include xeroderma pigmentosum, dysplastic naevus syndrome and large congenital melanocytic naevi. Amelanotic melanoma is often difficult to diagnose because the lesion will present as a skin-coloured or red/purple lesion due to the lack of melanin. For the patient described above, the features of bleeding and rapid growth make a diagnosis of amelanotic melanoma very unlikely. Pyogenic granuloma. This is the correct diagnosis. A pyogenic granuloma is a relatively common, benign vascular lesion of childhood of unknown cause that is common in children between the ages of 1 and 4 years. The typical history is of a solitary lesion that begins as a small, bright red papule and undergoes a rapid period of growth over weeks to months. If left untreated, it is susceptible to easy bleeding and ulceration due to its vascular nature, and it can sometimes be mistakenly thought to be a lesion caused by the child scratching. Although a pyogenic granuloma can occur anywhere on the skin, including on mucosal surfaces, it is most commonly located on the skin on the face or neck. The size can be variable, but the vast majority tend to be small, usually no bigger than 10 millimetres. Pyogenic granuloma can involute spontaneously, but this is rare, and intervention is almost invariably required because of the recurrent severe bleeding. Traditional methods include surgical excision, laser and curettage, but these are often complicated by scarring and dyspigmentation and there is a risk of recurrence. Treatment of pyogenic granuloma with topical imiquimod 5% cream has been described by a group of Australian dermatologists and shown to be a safe and effective.2 The cream is applied to the lesion and 1 mm of surrounding skin once daily until the lesion resolves, which may take up to several weeks. There is usually initial inflammation and swelling, which is followed by necrosis and then lesion shrinkage and separation from the surface of the skin. In the authors’ experience, imiquimod is almost always effective for a pyogenic granuloma and the majority of lesions eventually respond, with rapid cessation of bleeding (within a few days) followed by resolution of the lesion with minimal scarring and no recurrences. This is an off-label use of imiquimod. The lesion described in the case above was treated with topical imiquimod, with good result. A response was evident after two weeks of treatment (Figure 2), with resolution of the lesion after another two weeks of treatment (Figure 3). The patient was eventually left with a small, flat, white scar. For patients with pyogenic granuloma for whom imiquimod is ineffective, surgery is recommended. Surgical excision is likely to leave a more significant scar than imiquimod treatment, and small children may require a general anaesthetic. 1. Ceballos PI, Ruiz-Maldonado R, Mihm MC Jr. Melanoma in children. N Engl J Med 1995; 332: 656-662. 2. Tritton SM, Smith S, Wong LC, Zagarella S, Fischer G. Pyogenic granuloma in ten children treated with topical imiquimod. Pediatr Dermatol 2009; 26: 269-272. Associate Professor Fischer is Associate Professor in Dermatology at Sydney Medical School – Northern, University of Sydney, Royal North Shore Hospital, Sydney, NSW.